Faced with a long list of seasonal garden tasks in the fall —from planting garlic to capturing leaves,to preparing the garden beds for spring —the long row of raspberries often claim attention first. Pruning raspberry canes makes them more productive and easier work around when the raspberry picking season comes next summer. For those like us with prominently displayed raspberries,pruning also makes the row look more presentable,especially during the winter season when the canes are bare. Raspberry pruning should be reserved for days that are cool enough for a full-cover of thorn-resistant clothing but warm and dry enough for the relatively slow-moving task and frequent kneeling. I’m not aware of any botanical timing concerns for pruning raspberries —any time from fall to spring should work just fine —so for this task,you can indulge in attending to your own comfort. 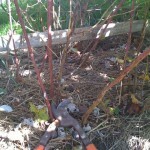 Pruning raspberries and other fruits that grow on canes isn’t difficult. Next year’s fruit will grow on the canes that grew out of the ground this year,so the goal is to cut out last year’s spent canes. In fall it’s easy to see the difference between the two because this year’s canes have a lively bronze or reddish color and many still have leaves attached to them. Old canes look old. They have brown,cracked bark and bare branches. Once you identify which are the old canes,cut them out at the base. If they are sufficiently dried out,sometimes they will snap off at the base with just a yank of a gloved hand. 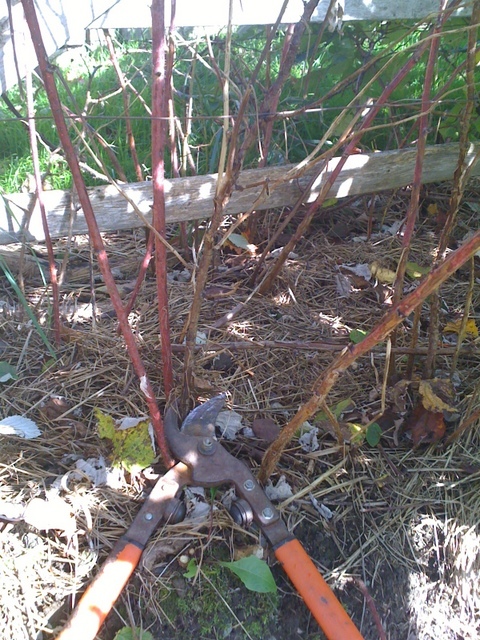 Removing last year's gnarly canes. While pruning,I also cut out some of the new canes that are short,spindly or growing too far away from the row. If healthy green leaves remain on these,you can dry them for use in herbal teas. Raspberry leaves are said to be rich in vitamins and minerals and can be used as a daily tonic alone or in combination with other herbs,as the taste is mild and blends well. The leaves are best known as an herb for pregnant women but also said to be beneficial for people at all stages of life. For so-called ever-bearing raspberry varieties,like Heritage,that bear a fall crop of berries on first-year canes,the normal practice is to mow down all the canes at the end of the season to invest fully in the the next year’s fall crop. My fall raspberry season is usually cut short by frost so I haven’t found the mow-down approach to be worthwhile. Instead,I prune my Heritage berries the same way as my summer,Boyne Red berries. The only difference is that after a killing frost,I also prune off the top segments that produced the fall berries. 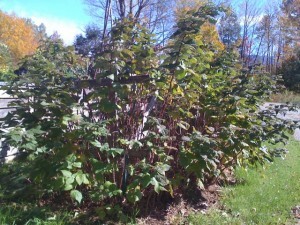 The next summer,this allows side shoots to grow and produce more berries on the same canes. When finished pruning,I mulch the soil around the plants,applying a thick layer of hay. Hay mulch,as it breaks down,appears to provide sufficient food for the raspberry plants so no other fertilizer or soil amendments are needed. It also suppresses weeds and maintains even soil moisture. The annual maintenance is complete when all the remaining canes are tucked in between the two levels of wire fencing. 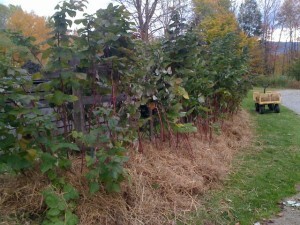 Instead of planting raspberries in a patch,I highly recommend planting and training the canes to a row,fencing with a four-wire system and mowing around the row to prevent the plants from spreading horizontally. The four-wire system is explained in this very infomative booklet. Raspberries are one of the easiest fruits to grow in Zone 4 if you take the time,once a year to give them what they need. This was first posted a couple weeks ago under a different title,but when I was messing around re-loading my iPhone version of the WordPress,somehow the post vanished. So here it is again,hopefully slightly improved.